Crankworx creates happy faces and bright eyes wherever it goes. As the countdown to the second edition in Innsbruck continues, children and teenagers of all ages are looking forward to Kidsworx presented by Tiroler Tageszeitung with its huge range of activities going on throughout the world’s biggest gravity mountain biking festival. This year once again the Crankworx World Tour will bring together fans of gravity mountain biking in four legendary locations around the globe. From 13 to 17 June the world’s best riders will gather at Bikepark Innsbruck (Mutters, Götzens) for the second time to battle it out in the disciplines of Whip-Off, Pump Track, Dual Speed & Style, Slopestyle and Downhill. The return of Crankworx also means the return of Kidsworx. Budding racers, children and teenagers together with motivated parents will this year once again be invited to take part in this diverse range of activities taking place alongside the pro competitions. Kidsworx Innsbruck presented by Tiroler Tageszeitung promises to be a highlight of Crankworx Innsbruck, building on the success of 2017. “After receiving so much praise for Kidsworx last year it was important to us to offer an even wider range of workshops and events this year. 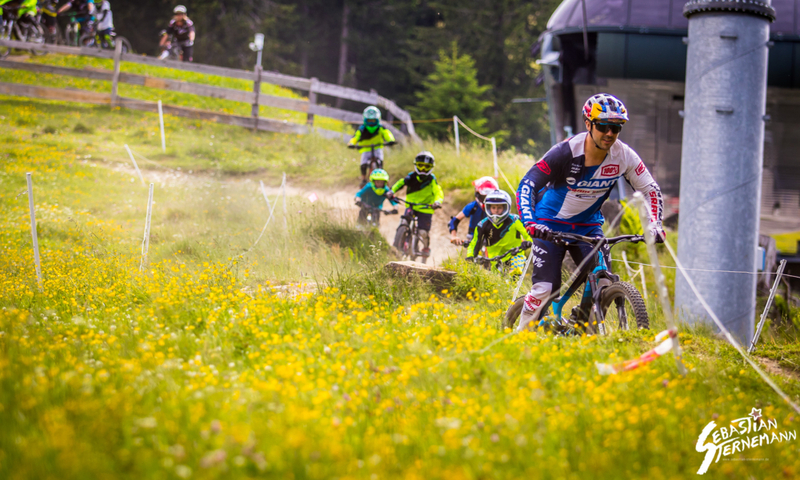 The schedule has been developed with the local downhill mountain biking club and aims to bring children together to enjoy being active outdoors in the fresh air,” explains Georg Spazier, head of the organizing committee behind Crankworx Innsbruck. On your bikes, it’s Kidsworx time! Highlights of this year’s Kidsworx Innsbruck presented by Tiroler Tageszeitung are set to include the Pump Track Kids Challenge, Ride with a Pro, Mini Kids Race and Family Game. School classes from the surrounding region will be invited to take part in the School Bike Days and School Goes Crankworx initiatives (14 & 15 June). For holders of a Festival or Single Ticket, access to all Kidsworx activities is free of charge. To sign up for an activity please visit the Tiroler Tageszeitung stand at the Expo Area in Mutters. Teachers interested in taking part in an activity together with their class can contact the Tyrol Teaching Authority or get in touch with the local downhill mountain biking club via office@downhillvereintirol.at. Children and youths aged between 6 and 16 years keen to get a taste of what racing is like can take part in the Pump Track Kids Challenge on 15 June. The event will this year once again be held on the original Crankworx Innsbruck pump track. A free pump track training session with experienced coaches and a special guest is available for youngsters wishing to dial in their skills ahead of the event. The Ride with a Pro workshops on 13 and 16 June will make mountain bike dreams come true. Kids and teens who have always wanted to meet a pro downhill rider in person have the chance to do so during Crankworx Innsbruck. Participants (7-17 years, must have some previous experience trail riding) get the chance to go riding with a pro, pick up tips on bike-handling and find out what it means to be a professional downhiller. Children up to the age of six years can enjoy their moment in the spotlight during the Mini Kids Race on 16 June. The course can be ridden on either a balance bike or a normal bike. Participants have the chance to take part in their first race and, most importantly, have fun on their bikes. The second edition of Kidsworx in Innsbruck comes to a conclusion with the Family Game on 17 June, where children and parents are in with a chance of winning a Kidsworx Family Medal by completing a series of tasks linked to bikes and cycling. The difficulty level varies depending on the age of the child so that all parent-child teams have the maximum amount of fun. The Family Game takes place ahead of the Downhill final in Götzens. Registration for Kidsworx Innsbruck will take place at the venue in Mutters. Please visit the Tiroler Tageszeitung stand to sign up. Registrations will be handled on a first-come, first-served basis. All Kidsworx Innsbruck activities are free of charge. All children aged 12 years and older must have a valid Festival Ticket or Single Ticket in order to take part. Festival Tickets can be purchased now via crankworx.com as well as at Innsbruck Tourist Information (Herzog-Friedrich-Straße 21, 6020 Innsbruck) and all branches of the Raiffeisenbank in Tyrol. From 18 May tickets will also be available from the bike shop of the Bikepark Innsbruck (at the bottom of the Muttereralmbahn cable car). Admission to the event is free for children under 12 years of age. Adults (18 years and older) can buy a Festival Ticket now for just €15 (€20 on the day), while youths aged 12 to 17 years pay €12 in advance (€15 on the day). For downhill fans there is the option of purchasing a Single Ticket valid only for the Downhill event in Götzens. This ticket costs €5 for visitors of all ages and is only available on the day (no pre-sale). The shuttle busses from Innsbruck to the competition sites (Mutters, Götzens) and back will once again be free for all visitors this year.